Here's to you Kev . Your posts and participation on the board are always of the highest quality. All I can offer is this low integrity post, have a wonderful day off Gouligan. Thanks very much everyone. I wish I had the day off, got hit with some weird flu yesterday that probly came home with one of my kids from school, was supposed to work from home today but ended up having to go in to the office, and now almost don't even feel like having beers. Key word there being almost, my wife brought me home a few fancy ones so I am drinking a few anyway. Happy Birthday Goulaigan! Hope you feel better. Have a Happy Birthday Todd. Thanks all! 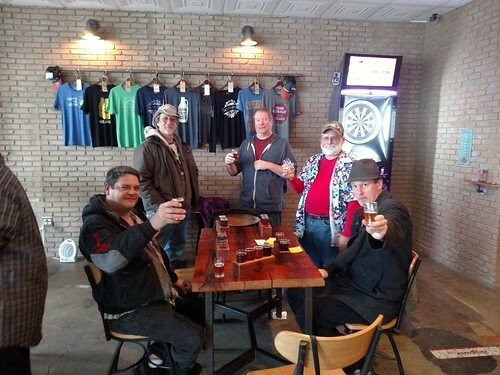 My GF and several friends surprised me this past Saturday morning by showing up with a chauffeured van and taking me on the local beer trail (there are dozens of craft breweries here in Rochester and the surrounding area). We managed to get through 5 different breweries before the day was over, it was a great present and a good time was had by all. The only downside was that my GF had told me we were going to a holiday lunch for her employer so I had skipped breakfast although I suppose a flight of ales at 11:30 AM on a Saturday morning could be considered breakfast. Last edited by thughes on 29 Nov 2016, 20:45, edited 1 time in total. Happy Birthday Todd! That sounds like a great birthday gift! On behalf of BIABrewer, many thanks for your contributions which include always quality posts on the board and the best of support to us off the main board. Happy Birthday, Todd and BobBrews! Frequently I don't get the emails on subscribed topics... Just noticed both of these. Todd - looks like you had a nice one...! BobBrews - your Packers beat my Seahawks... Oh well, the Seahawks are in the playoffs so we are good to go. And I hope they learned something through the process that helps them go all the way! Hey Bob - happy birthday mate . I hope you are smelling better this year and that, when you win Cheesetradamus this year, you'll get to see how it feels to get promised a Winnebago but never see it arrive. (I'm pretty sure that wasn't a postage problem ). The last year has been a relatively ramble-free year for you on the site. We all miss those rambles and expect a much better performance this next year (after you win Cheesetradamus). Happy Birthday Bob! Any ice down there yet? Seem like this year may be better than last was for ice fishing / brewing, here at least. Anyway, hope it's a good one!!! Yeasty, looks like you are as only good as your last year - lol! Don't worry mate, one of my sister's birthdays is on 26th as well and I only just remembered that. I blame mally as he usually takes care of this thread . I know you've had a busy year, hope the coming one is more relaxing for you and, of course, we miss you! Happy belated birthday bloke and thanks for all your contributions to us. Happy birthday James jrstephens65 How did your lager turn out? Mad_Scientist wrote: Happy birthday James jrstephens65 How did your lager turn out? Funny you should ask! I just sat down with the first pint (saved it for my b-day). Over all I am very happy with it, I wish it had a little more hop aroma but at a IBU of 16 I didn't expect much. Not sure why the pic is sideways.... Was right side up on my computer when I copied it.. I am enjoying a lager / Pilsner right now too. Yours looks like a Helles, or something like that. Hope you had a good one. Last edited by Scott on 04 Feb 2017, 11:25, edited 1 time in total. Happy Birthday Sarah Thank you for coming along when you did, you're "a shot in the arm" to Pat. Looking forward to lots more fun and laughs. Wishing you a fantastic year!! !